Bronn vs. the DothrakiEpisode 4 of Season 7, “Spoils of War,” ends with a major battle between the Lannisters and Daenerys’ Dothraki horde and her dragon, Drogon. 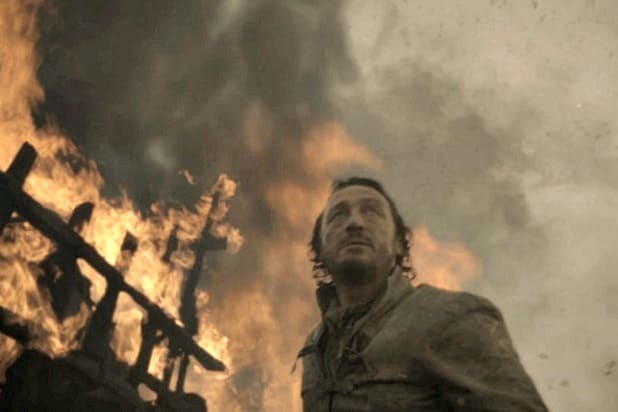 Bronn mixes it up in the battle with quite a few guys, but the best is his long-running chase scene in which he’s pursued by a Dothraki warrior. First the guys cuts off his horse’s leg, then chases him around the battlefield, before Bronn finally outsmarts him for the big win. Arya vs. BrienneWe’ve seen Arya get into fights before, but never a straight-up sword-to-sword battle. Who better to take her on than Brienne of Tarth, a skilled warrior who beat Jaime Lannister (not at his best, to be fair) and The Hound, to train with? Arya breaks out her Water Dancer skills against Brienne’s knightly style of fighting, and matches her speed against Brienne’s strength. In one of the best-choreographed scenes in the show, the pair come to a draw. 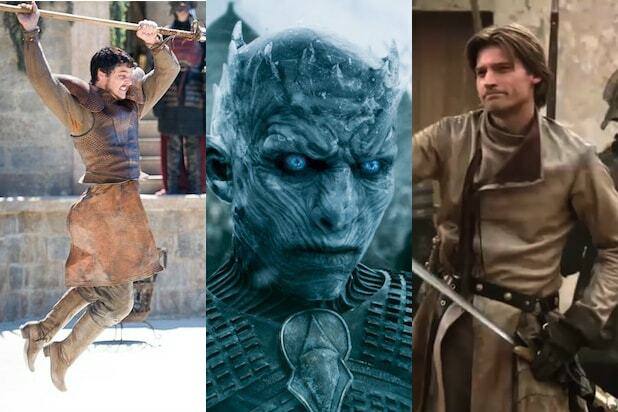 Now we need to see them fight together against some other guys, like White Walkers. Jon vs. RamsayThis isn't much of a fight, with Ramsay firing arrows at Jon who just barely avoids them, but it is an intense moment. Ramsay's last-ditch attempt to beat Jon comes close, but results in getting his face pounded in -- which, to be fair, Ramsay richly deserves. Arya vs. the WaifArya and the Waif have been fighting for an entire season, with the Waif repeatedly beating the tar out of Arya. But when the Waif comes for her the last time, Arya turns the fight into a lengthy, intense chase, until she can get the Waif on even footing -- in pitch darkness. We don't get to see the final fight, but imagining it is pretty good too. Ned vs. JaimeThe duel between Robert's Hand and the Kingslayer is one of the first one-on-one duels in the series. It's a short fight bookended by two gruesome stabbings, but the excellent choreography teases the bigger fights to come. And you can see the intense disappointment on Jaime's face when one of his men-at-arms ends the battle with a cheap shot to Ned. A Khal's WrathNever call Khal Drogo's wife a "foreign whore." Mago's gruesome punishment for his insult toward Daenerys comes at the end of one of the more unusual fights in the series. Drogo gets to show the agility beneath all that muscle before killing a man and ripping his throat out with his bare hands. Brienne vs. JaimeJaime has the disadvantage of being shackled and severely weakened from his time as Robb's prisoner, but that won't stop him from running his mouth. Taking place on a narrow bridge, this duel makes the list thanks to its claustrophobic, over-the-shoulder shots as the two point their swords at each other. Syrio's Last StandIn his short time in the series, Syrio Forel won fans over with his wit, charm and ability to look badass with a wooden sword. His offscreen death was a kindness rarely afforded to the characters on this show. The Hound vs. The Flaming SwordBeric Dondarrion's burning blade is the closest this show will ever get to a lightsaber. But as impressive as it is, Sandor Clegane still conquers his fear and chops through the sword ... and Beric himself. Drogon and the PitNot everything in "Game of Thrones" needs to be gritty realism. Sometimes intense fantasy is in order. The massacre at Daznak's Pit last season ended with the arrival of a fully-grown Drogon, who chomped and burned anyone who would dare threaten Daenerys. Shout-out to Ser Jorah's hard-fought victory immediately before everything turns to chaos, as well. Duel in the EyrieTyrion's first trial by combat between Bronn and Ser Vardis was arguably the best choreographed duel in the series. Taking full advantage of the Vale's throne room, the scene shows swords clashing on staircases, between columns, and of course, over the edge of the infamous Moon Door. BlackwaterThe episode-long battle between Stannis and the Lannisters still stands up as one of the series' best installments. Little surprise, considering George R.R. Martin himself wrote the episode. Brienne vs. The HoundOne of the toughest fights in the show between two of the toughest people, the duel between Brienne and the Hound is a drag-out fight of epic proportions. 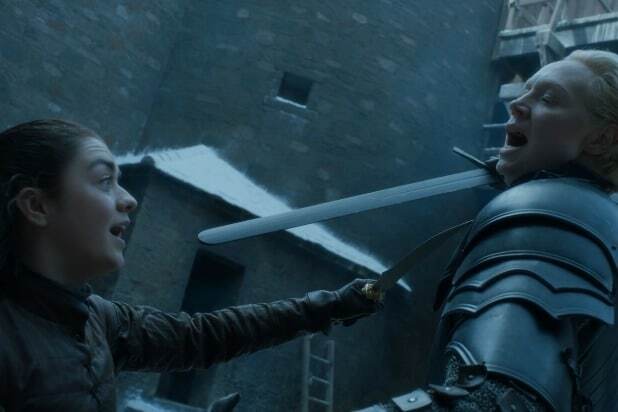 Both take a rough beating as they battle over Arya Stark, with the Hound eventually going over a cliff for his trouble. Ned vs. The Sword of the MorningWhen Bran and the Three-Eyed Raven visited the past, they saw Ned in a legendary battle with Ser Arthur Dayne, "the best swordsman" Ned said he'd ever seen. Wielding two swords, Dayne fought of something like six men alone. He'd have killed Ned too, very likely, if Howland Reed hadn't stabbed Dayne in the back. Battle of the BastardsThe battle to retake Winterfell from the Boltons is about 10 minutes of intense chaos, and some of the best action of "Game of Thrones." Mostly it's just Jon Snow barely avoiding getting shredded by galloping horses, with the occasional fast-paced ravaging of some poor man-at-arms dumb enough to stumble past. The battle highlights how confusing and insane large-scale medieval battles were. The Mountain vs. The ViperLike any good sequel, Tyrion's second trial by combat brought more hype and higher stakes. In the days leading up to the episode, fans treated the fight between Gregor Clegane and Oberyn Martell like a UFC title fight. The duel was everything we hoped it would be, and the kill shot was the most violent and horrific in the history of the show. HardhomeWhen it comes time for "GoT" to come up with its explosive finale, this is the bar they have set for themselves to top. The true power of the White Walkers and their wights was on full display last season, and the sight of the Night's King converting the wildlings into new troops is absolutely chilling. But it's not all bad for the heroes. Jon slaying the White Walker with Longclaw is the coolest thing he's ever done ... and hopefully not the last. Having trouble remembering all those important secondary characters that aren't with us anymore? Check out our gallery of important but dead characters you've forgotten.